Who Was Arsenal’s Second Permanent Manager? According to every Arsenal history written since 1986, George Elcoat was Arsenal’s second manager. Up until 1952 he was only known as Mr Elcoat. Then Bernard Joy wrote “Forward, Arsenal!” and gave him an initial so that he became G. Elcoat. He remained this way until 1986 when the club’s official centenary book was published and gave him a first name – George. Sadly, Bernard Joy and Daniel Feinstein (historian for the centenary book) are no longer with us to explain how they came about this information. They got the wrong man. We’ve seen that there are a number of historical inaccuracies in Bernard Joy’s book. These have been subsequently copied by other authors. This is the case with Mr Elcoat. 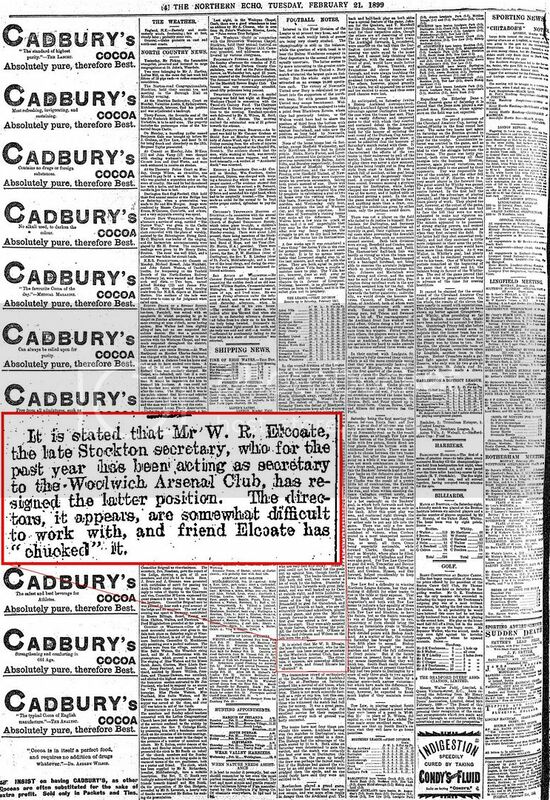 Arsenal’s second manager was not George Elcoat, but his older brother William Robson Elcoat. William was born in Elton, Durham in 1859. He managed Arsenal between April 1898 and February 1899. 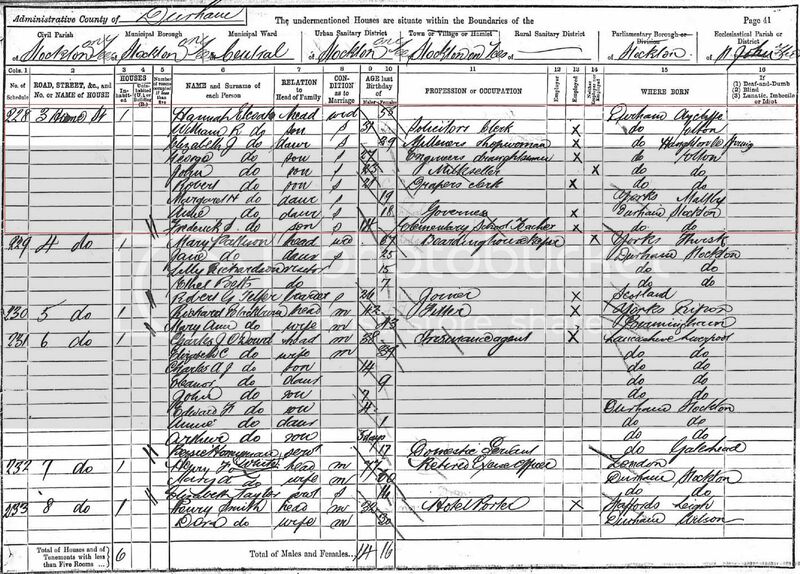 In 1891, he was living with his widowed mother and seven siblings in Stockton. He was working as a solicitor’s clerk. 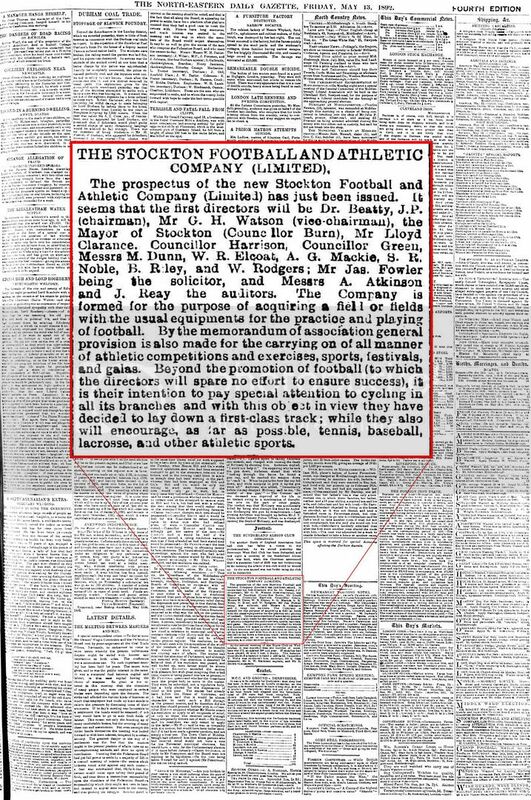 WR Elcoat was one of the original directors when Stockton FC turned professional and became a limited company in 1892. The club also played other sports, one of them being baseball. WR Elcoat was heavily involved in the baseball scene in the area. He was an umpire and chairman of the Cleveland and South Durham Baseball Association. In 1895 the club had problems with the incumbent secretary who had refused to produce paperwork for the club’s accountant to prepare the company accounts for the 1894-95 season. During the AGM in June 1895, the directors sacked the secretary and decided that WR Elcoat should take over the position. On 10 March 1898, Arsenal’s secretary-manager, Thomas Mitchell, resigned. I’ve not been able to ascertain whether a caretaker was put in place. If there was, it was probably director Arthur Kennedy (this will become apparent later). Sunderland manager Bob Campbell applied for the vacant position and it was offered to him. He accepted the offer on 18 March 1898 but then had a change of heart and decided to stay at Sunderland. WR Elcoat was then offered the job. 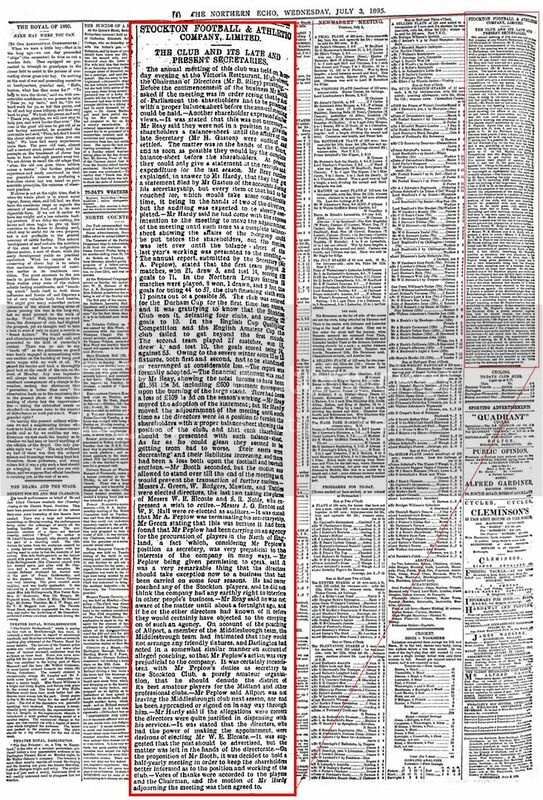 He accepted the offer on 30 March 1898 and he took up the reins during the week commencing 11 April 1898. 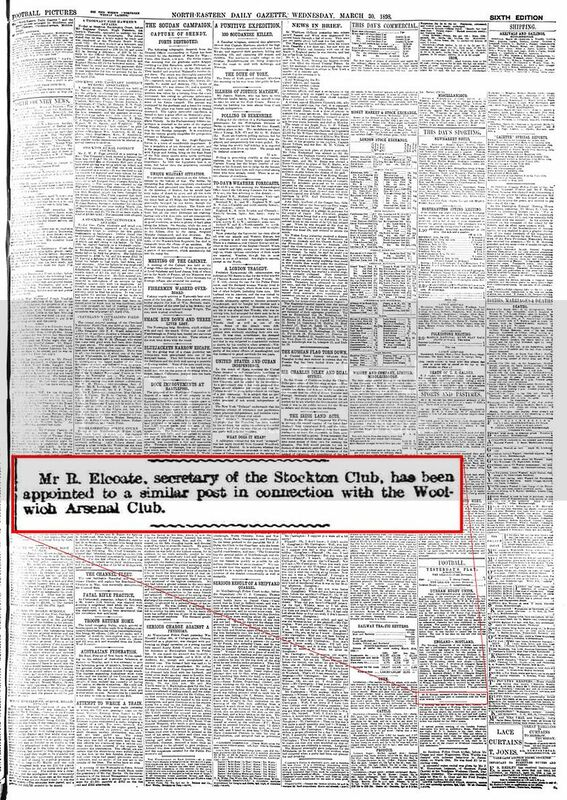 The club did not give a reason as to why they chose Elcoat but, financially, Stockton FC was run very well which would have been seen as a positive for the Arsenal directors. 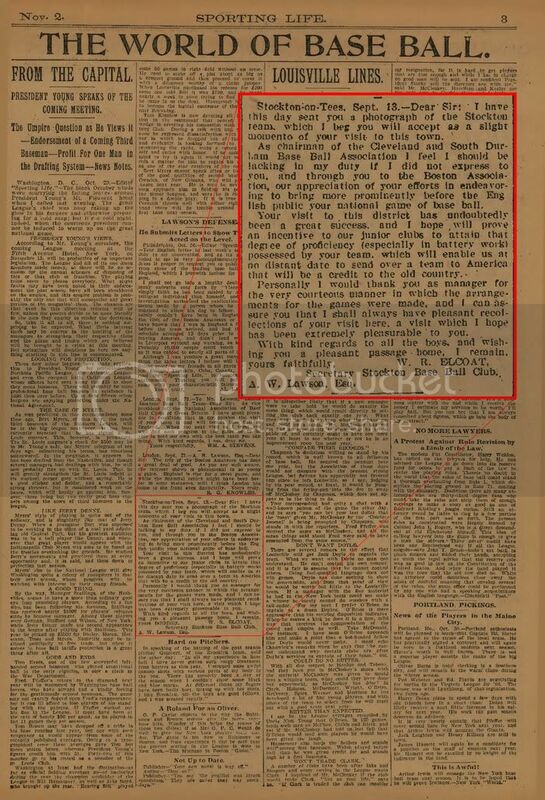 Also, Elcoat may have been friends of Arsenal director Jack Humble who came from the same area. 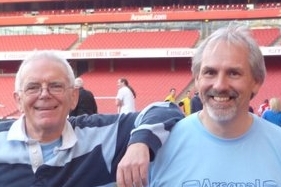 Elcoat’s tenure at Arsenal was just under a year. He resigned on 20 February 1899. It was reported that he found the Arsenal directors difficult to work with. When he took control of the team it was 3rd in the second division and he left them in 6th place. Director Arthur Kennedy was installed as caretaker secretary-manager for the remainder of the season. Something that I’ve recently found is a history of Woolwich Arsenal published in The Book Of Football in 1905. This was not actually a book but a magazine published in 12 fortnightly instalments. 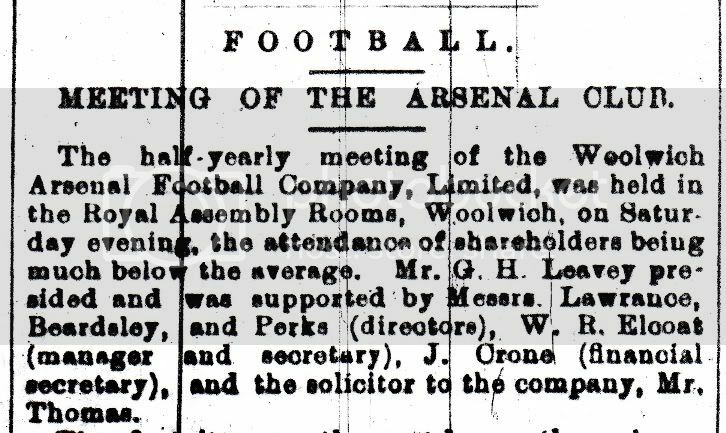 Part 1 was issued on Friday 20 October 1905 and contained the history of Woolwich Arsenal F.C, written by the club’s vice-chairman, Arthur Kennedy. What I find strange is that Kennedy states the names of Arsenal’s first four managers: Mr. T.B. Mitchell, Mr. Elcoat, Mr. Harry Bradshaw and Mr. Phil Kelso. For three of them he gives either their initials or first name. But Elcoat is recognised only as “Mr.” At the time that Elcoat was secretary-manager of Arsenal, Kennedy was the club’s financial secretary. I would have thought that they would have met on numerous occasions. Surely he must have known Elcoat’s name or even his initials. He returned to the family home in Stockton with his mother and siblings. He remained unmarried and died in Stockton in 1912. 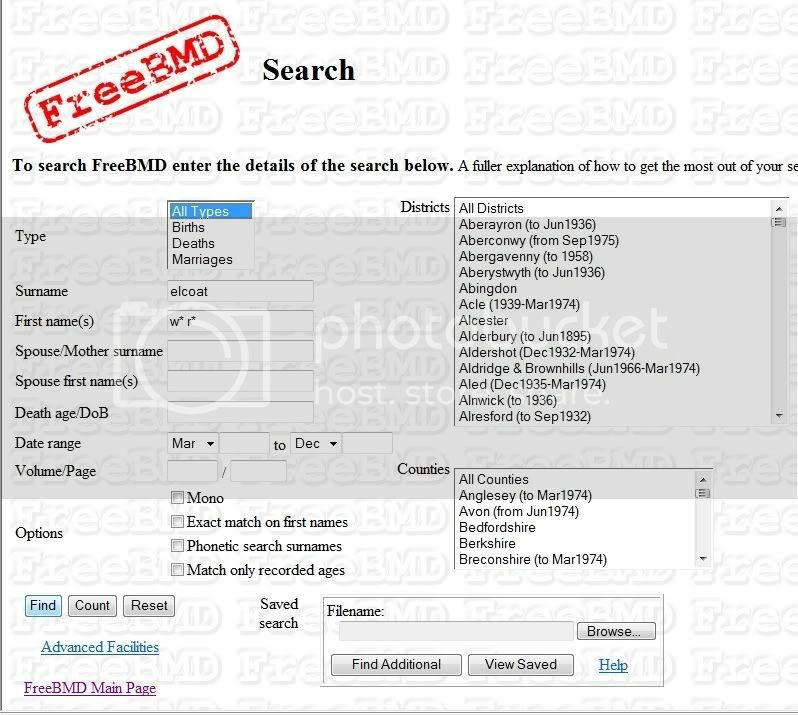 I have been aided in my research by the recent boom in genealogy which has resulted in a large amount of historical documents being made easily accessible. 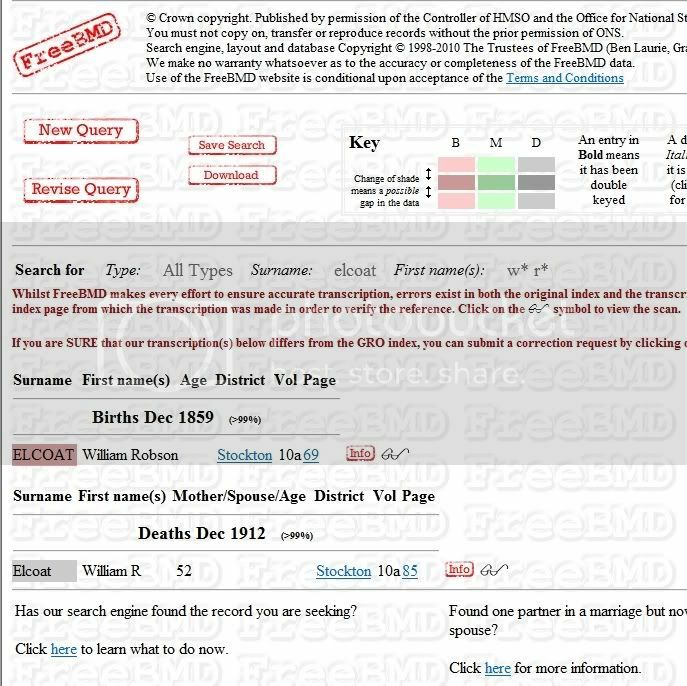 Sites such as www.ancestry.co.uk have made it possible to search for data in minutes that would have taken weeks or months 10 years ago. This is probably why such mistakes were made, with researchers giving up after long fruitless searches. History of Arsenal: a continuing review of Wenger’s reign, season by season.